The reason for tackling the project now is partly an awareness of the passage of time and advancing age, but also to the realisation that pretty much all digital transmitters use the Weaver architecture and that it would be a good to try this in hardware and at HF. In amateur circles, the Weaver method is really not that well known and its near universal use in digital transmission is almost completely unknown. Why this should be so is rather interesting, and deserving of its own chapter. This receiver is intended as the first step in the production of a complete transceiver for 80m that will run a nominal 100W of RF output. 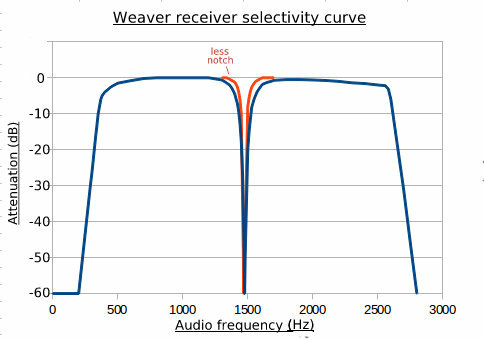 Understanding why the universal use of the Weaver phasing method is not generally appreciated by plenty radio engineers and amateurs alike seems to be down to way that digital communications has developed over the last two decades. Prior to that, the RF engineer would have be involved in all aspects of an analogue radio system and would often have developed most or all of the circuitry as well. The terminology used would often have been coined by that engineer or one like him and engineer could speak unto engineer with complete clarity. As digital processing and software evolved, it was inevitably integrated into the radio system, initially as separate blocks of control related circuitry. At this point in time, the RF engineer might even have been the designer of the hardware blocks involved. However, as processing power rapidly increased and its costs reduced, it became cost effective to think about replacing some or most of the RF circuitry too, and this opened the door for new software based architectures to be considered. The sort of people involved in this work, especially at the advanced development stage, were likely to be recently graduated types with a mathematical background, not an engineering one. The terminology used by them tended to reflect this, and I can't recall 'Weaver' ever being mentioned by any of these folk. So now we often had new words being produced even though Weaver already had perfectly good terminology in place that RF engineers understood (or at least recognised). To add to this, the Weaver process was and is done entirely in software for commercial products, so it was and is quite possible for the RF engineer to be totally unaware that a given equipment is using a Weaver architecture! 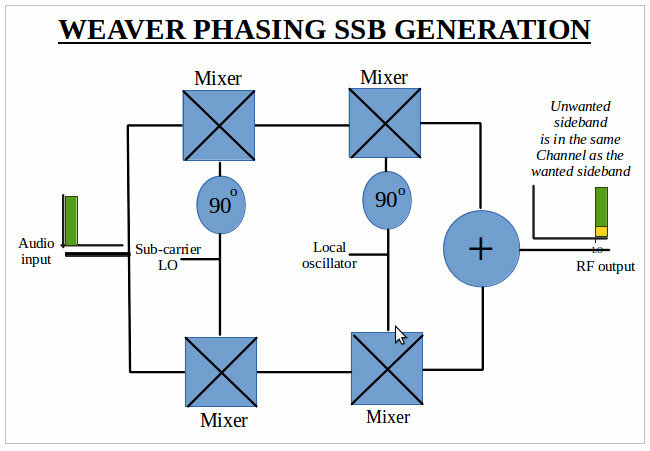 In 1956, Weaver outlined his method in a paper for the IRE called "A Third Method of Generation and Detection of Single-Sideband Signals" (Proc. IRE, Dec. 1956). 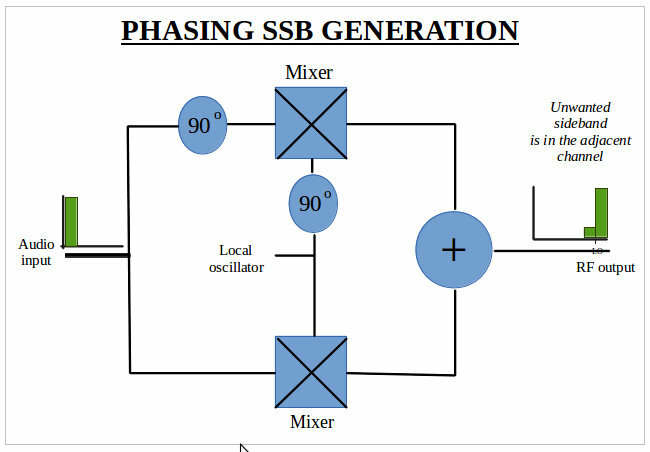 He was concerned with the reliable generation of two quadrature audio signals required in voice ssb generation using the phasing method. At that time, phase shifting involved the use of RC networks. Being frequency sensitive, multiple networks using relatively high tolerance components were necessary to cover the required 300Hz - 3kHz bandwidth. His method was essentially non-frequency sensitive. Translating a window of audio spectrum up to one at a higher RF frequency window is achieved by mixing the audio with a carrier signal that chops and inverts the audio at a rate determined by the carrier frequency. The resulting signal contains (in addition to carrier harmonic related components, which are easily filtered out) an upper and lower sideband spaced from the carrier by an amount equal to audio frequency component(s).This double sideband signal obviously takes up twice the bandwidth that it need do, so the removal of one sideband is desirable where the available frequency spectrum is limited, as was already the case in the mid 1950's. 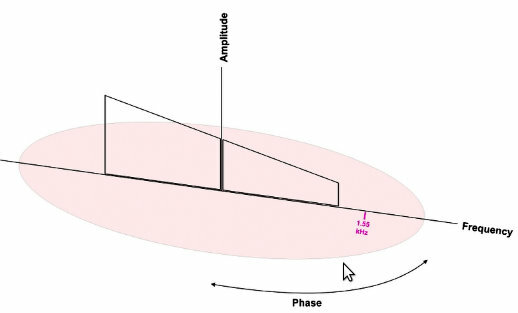 Vector analysis of the complex signal provides a reasonably simple method of showing how one sideband can be removed, as long as you use the carrier frequency as your reference rather than a fixed point in time. Consider a single audio tone (ie, sine wave) being mixed with the carrier signal. Relative to the carrier, the lower sideband (being at a lower frequency) takes longer to go through a complete cycle, ie, 360 degrees. seen on the plot to rotate in a clockwise direction. A second un-modulated carrier signal, derived from the first one, but with a fixed phase offset, will appear on the same vector diagram as a fixed non-rotating vector angularly spaced from the reference by that fixed offset. 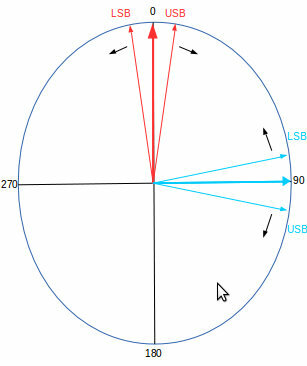 For the purpose of cancellation of one sideband, it is necessary to make this offset 90 degrees, though it doesn't matter if the 90 degrees is plus or minus. Since the first carrier is being used as the reference, it is usually referred to as the In-phase carrier ('I' for short). 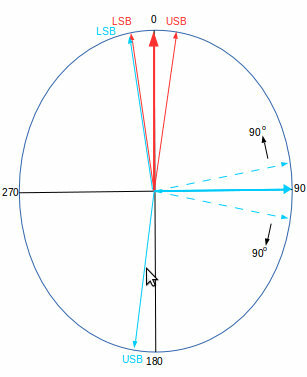 The second carrier, being offset by 90 degrees, is usually referred to as the Quadrature carrier ('Q' for short). If this second carrier has exactly the same modulation applied to it as the first carrier, then at any given time both sidebands will be displaced from their respective carrier by the same amount as they are in the first carrier case. Adding all the vectors results in the two LSB components enhancing each other to produce a signal twice the amplitude, whilst the two USB components, being of equal amplitude but in anti-phase completely cancel out - just what is wanted! If instead of delaying the audio to the second mixer, we advanced it by 90 degrees, you find that the two USB components are now in phase with each other and it is the LSB components that are in anti-phase and cancel. Differences in amplitude of the USB/LSB pairs, or a phase deviation away from the 90 degree nominal shift of audio to the second mixer will both result in non-perfect cancellation. 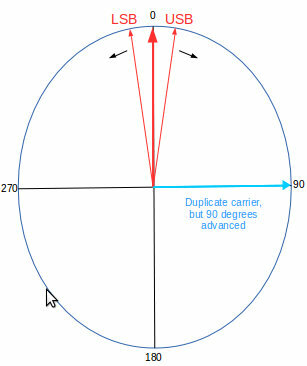 Although the quadrature relationships must be kept accurate, the position of the sidebands relative to their respective carriers is quite arbitrary. Wherever you choose them to be over the full 360 degree cycle, the resultant addition and total subtraction situation of the two sidebands will hold good. These days, it is quite trivial to digitise an audio signal and from that to generate a constant 90 degree phase shift over a wide bandwidth - you just throw as much processing power at it as is necessary. Once you have done this, you have (or rather, should have) a reliable and repeatable solution. In the 1950's, this was not an option and all solutions were implemented in hardware. They were based on RC networks, which of course have a varying phase shift with frequency. Not only that, but with varying phase shift you inevitably get varying amplitude. A lot of work was done to balance networks in such a way as to minimize these frequency conscious variations, but in addition to being complex and requiring close tolerance components, you would still be left with a degree of error. 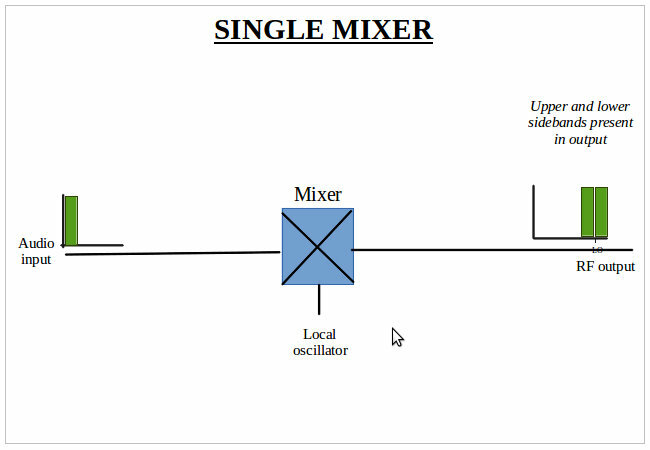 Two mixers are fed from the same audio source. Their local oscillator is also derived from a common pilot tone source, but a 90 degree phase shift is introduced to one feed. b) there are two translated signals per output, since the mixer will have generated both an upper and a lower sideband (ignore for the moment the additional components due to harmonics of the pilot tone - they can be filtered out). What Weaver realised was that if the pilot tone were placed about half way up the audio spectrum, things could work out very nicely. It is the LSB component that is useful - the USB sideband is not of any use, but it is not difficult to remove. A low pass filter with a cut-off frequency about the same as the pilot tone frequency will do this nicely*. The wrapped around portion of the LSB component (ie, the highest frequency half) changes phase by 180 degrees after reflection and this is what Weaver was able to take advantage of. *A MAX7403 switched capacitor filter IC, for example, has a cut-off attenuation of 60 dB at 1.2 x the turn-over frequency. In the example opposite, that would be 1.2 x 1.55 = 1.86 KHz ie, just within the LF end of the USB component. It would be much easier if we could display the mixer output spectrum in 3D, and the image opposite is my attempt to do this. 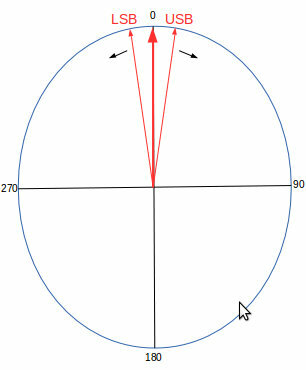 The vertical access represents amplitude, the diameter of circle/ellipse represents frequency and angular displacement around the circle/ellipse represents phase. We've removed the USB component of the previous graph by passing the composite signal through a low pass filter, so all we are looking at now is the LSB component. Now that we have a phase axis, we can show the 180 degree phase change as the LSB components wraps around the zero frequency point. If we display both mixer outputs together in this same way, the 90 degree mixer LO difference will be reflected in a similar 90 degree relationship of the two outputs. These two orthogonal signals are then applied to the two RF mixers of a conventional phasing exciter and the phasor plot logic applied at the beginning of these explanations may be applied again. So we can take a couple examples of sine wave modulating frequencies and see if there are any interesting features resulting from passing them through both the pilot tone and the RF mixers. 1 kHz applied to each pilot tone mixer (pilot frequency = 1.55 kHz) produces an LSB output at 0.55 kHz and a USB output at 2.55 kHz, but this USB output is filtered out by a low pass filter with cut-off of 1.55 kHz. 2.1 kHz applied to each pilot tone mixer (pilot frequency = 1.55 kHz) also produces an LSB output at 0.55 kHz and a USB output at 3.65 kHz. Again, this USB output is filtered out by the low pass filter. Since it was to hand, a Finningley 80m dongle board was used as the first mixer. Likewise, the second pilot mixer and some associated circuitry was lifted from Matjaz Vidmar S53MVs suite of microwave receivers. The 1.4 kHz Low Pass Filters used switched capacitor filters, partly in the hope that since they used a common clock source they would be reasonably well matched, though I have no information on what tolerances are involved within the Maxim MAX7403 chips (this range of chip, ie MAX7401, 7402 and 7403 are worth looking at anyway because of their simplicity of use, being 8 pin IC's requiring minimal support components). One potential problem that arises with the use of switched capacitor filters is the need to do some pre-filtering to avoid spectral components at the clock frequency (which is 100 x the turn over frequency) and harmonics thereof. Initially, this was not taken into account and caused a good deal of confusion when, using a signal generator as the RF mixer LO, I found that I could hear the same QSO at cyclic intervals of the LO frequency! 555 ICs were used to generate both the pilot tone and the clock for the switched capacitor filter, since this gave the chance to easily change their frequency during testing. For the final transceiver design, it is intended to use a quartz controlled oscillator, particularly for the pilot tone generation, so that the overall carrier frequency can be maintained at good accuracy/stability. i) Some amplitude equalisation was added to counteract audio droop with increasing frequency. ii) A pilot tone notch was added to remove the small amount of leakage that was noticeable when no antenna was connected. The resultant selectivity curve is as shown opposite. Although with the pilot tone notch in-circuit the mid frequency notch width increases, I can't say that it is noticeable when listening to the usual ssb signal. The 300Hz end cuts off a little too early, so either the pilot tone frequency could do with being decreased by a hundred Hz or so, or the LPF corner frequency increasing by the same amount. Playing around with these two frequencies was one of the things that I wanted to do with this receiver. It would not be that difficult to link these together so that a variable width facility could be added - this was one of the advantages of using the switched capacitor filter implementation. The response outside of the pass-band on either side remains attenuated by at least 60dB - there are no horrors to be found as you tune away from the main signal. 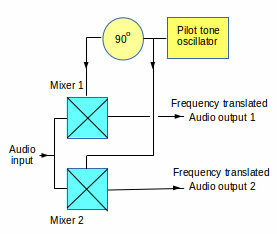 To keep pilot tone leakage to a minimum, the pilot tone mixer is run at a high signal input level, so to avoid clipping on strong signal inputs a manual RF attenuator was placed between the RF amplifier and antenna input. The test receiver worked well enough to make a tidy version worth doing. Whilst we're at it, we may as well make it a full transceiver . There are still a few spurious signals present that might be worrying on transmit, but the arrangement seems to be working on receive without problem. Initially, at least, there is no audio compression, just some shaping (10 dB of HF lift, which people tell me suits my voice). There is a clipper, but I've been running things at or only just above clipping. There is a 3 kHz low pass filter that follows this, again using another wonderful MAX7403 switched capacitor LPF chip from Maxim. Since the low pass filter edge frequency isn't that critical (there are other filters later on), the internal MAX7403 RC clock oscillator is used. Note the use of three sections of the final LPF to remove any harmonically related spurious products. This initially used a 555 timer to set the two MAX7403 filter cut-off, but it was thought that a crystal controlled oscillator might be better! The cut-off frequency is 1.2 kHz. The circuitry here is just a reconfigured version of what is in the receiver. This is very much the circuit used on the receiver, but with the inputs and outputs reversed - the only real difference being the addition of a couple of carrier null pots. Carrier leak is way down and seems to remain stable at that level. Given that the mixer output is balanced, and a transformer is used with its output winding able to be floating, the opportunity was taken to use a PNP device in the following amplifier - it just seemed nice to have its output referenced directly to ground. The BSP31 general purpose device seemed to work OK (and lots of them going spare). A mish-mash of devices are used in the amplifier, with only the MRF5015 being a recognised RF device. Partially decoupled emitter/source resistance is used on all three devices to maximise linearity and all run with relatively small collector/drain voltage/current swings for the same reason. The 2SK3067 switching FET in particular did not like drain voltage swings down towards 0v. Having the gain well pegged back and adjustable is also useful later on to allow final gain requirements tweaks. It was originally intended to build up a driver and push-pull output pair that would run at 100 - 150 W PEP output, but when you are so close to having a usable transmitter, it is easy to compromise and just put in a single ended PA and see what it will give! The output device is a 28v 325W maximum dissipation FET from an old 1800 MHz cellular base station. These types seem to work OK at HF and this one gave just over 20 dB of gain. With the high dissipation spec and 28v supply rating, I expected it to be bomb-proof operating at such low power and 12v supply, but it did die after about a week. On measurement, the FET gate to source had become low resistance, so removing the bias, apart anything else. There was still output, and had the gate volts been forcibly increased, the gain would have been back at 20 dB, I suspect, so this must be a multi-source site device. Although the gate looks to be well damped at RF with the 20 ohms loading resistance, they were not placed right on the gate with 1800 MHz in mind, so my suspicion is that the stage had taken off at a UHF/microwave frequency. Rather than blow up more of these devices, a very old (late 1970s) S100/28 bipolar was used as a replacement, with the biasing circuit modified to suit. The gain is not quite as high, but it still gives 25W PEP output, so the stage has been left like this till a later date. It might even be a good idea to run this stage in class A at say 10W PEP and use an external linear. Done this way, a very linear drive source could be guaranteed. 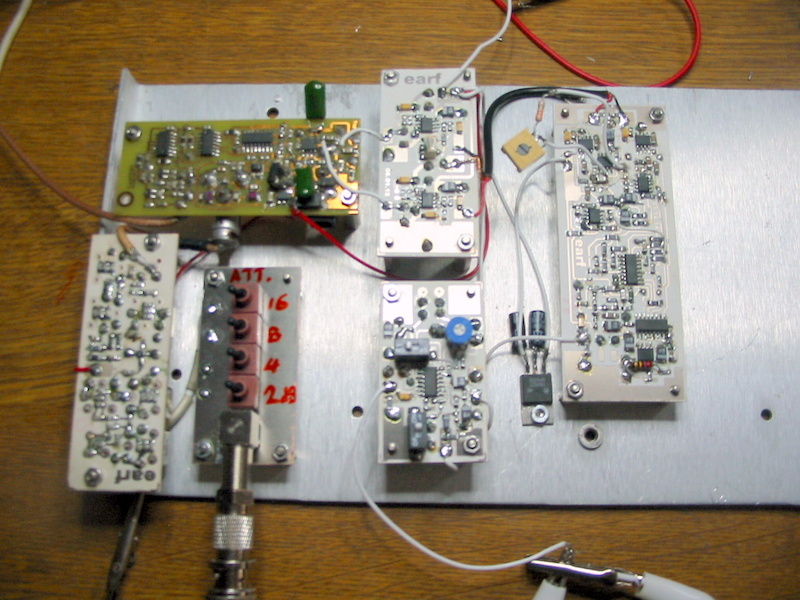 Having reduced the transceiver output to 10W PEP, an external linear was used to increase this towards 100W. Initially, a pair of GU50's were used in grounded grid configuration, but only 7dB of gain was achieved, giving 50W output. Valves were used because there would be no issue of destroying them through misuse/ bad antenna match, but the feeling that this was a cowards way out eventully led to contemplating a solid state linear. There were plenty of RF power devices kicking around, however, the idea of using a high voltage switching FET on a relatively low supply voltage appealed because there was going to be no VSWR shutdown and that large voltage overhead seemed to make sense. A good number of IRFP450 and similar TO-247 FETs were available and these were all tested in a jig driven by a signal generator and 10W amplifier combination. Results were very encouraging - gain, power out and linearity were all excellent, with just a single device being enough to provide the required 100W. Even some cheap Chinese IRFP450s obtained via ebay (5 for £3.50, post free) worked just as well. A scrap heat-sink had already been used to play with FETs for use in AM transmitters, so this was dragged out and put to use again. An interesting early experiment was to feed the output directly into 50 ohms, ie, to not use an output matching transformer. The output power is then really only determined by the supply voltage used. Being single ended and biased in class B, only half cycles are being amplified, so to make life easy/simple, a low pass filter was always added to the amplifier output, ensuring that the measured output was converted by the lpf flywheel effect into an RF sine wave and thus easy to measure as a meaningfull RMS power. Arranged this way, a 70v supply rail equates to about a 25 to 30W PEP maximum linear output. The drain to source capacitance is given as 720pF, to which must be added the 560pF due to the heat spreader to main heat-sink interface capacitance. This 1280pF total was resonated out using the drain choke, but it might complicate things a bit if multi-band operation were being considered. Bias is left 'on' at all times. No instability is present when in receive mode (when both the amplifier input and output are left open circuit by the change over relay). The antenna low pass filter and power monitoring detector are pretty much identical to that used in the basic transceiver, so are not shown here. The regulated power supply is capable of adjustment up to 80v, but for the moment, the amplifier is being fed at 70v.